Good ole Labor Day - a national holiday given to the American people following the deaths of a number of workers at the hands of the U.S. military and U.S. Marshals during the Pullman Strike of 1893. Summer's officially over, kiddies are returning to school, and next thing you know it will be Thanksgiving break, then winter break, then spring break, and so goes the cycle of life in working-class America. 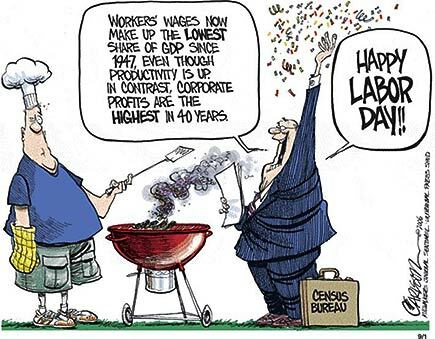 This Labor Day seems different than years past, as there is a new level of discontent growing amongst those affected by our struggling economy. The nation is caught up with the unemployment level and concerned over what to do to spark a growth in industry that will produce more jobs. All around the country, people are worried over America's self inflicted decline. Those lucky enough to have employment are most likely dissatisfied with their positions and merely continue on to survive, because that's what is expected of them and what they need to do. We are a society of people that work so that we can enjoy the weekends and those holiday breaks craftily dispersed throughout the calendar year. Is this what we humans are here to do with ourselves? Are we put here to sell our lives away to the highest bidder so that we can enjoy the short intervals of leisure time provided to us? Even if you are fortunate enough to be one of the few able to follow your "dreams", that often comes with necessary debt obligations in some form or another and eventually you must continue doing something that once upon a time you chose to do, and the former dream becomes your inescapable routine. Labor Day symbolizes the great fight between leisure and work ethic, and as one author explains, it has been going on throughout American history. More and more it's apparent that Karl Marx was correct about the evils of capitalism. Why else would the American government fight so vigilantly against the spread of Communism during the "Red Scare" period of the 1940s and '50s? Marx predicted that in a capitalist society, the distribution of wealth between rich and poor would continuously increase in favor of the rich. Marx and Friedrich Engels wrote the Communist Manifesto not as an academic exercise, but as a call to action. Its aim was not only to expose the capitalist system's failings, but to show how it could be transformed by the collective action of the mass of workers and oppressed people. Today, more than ever, we must look at our current system and reassess it. The assets of the top three billionaires are more than the combined gross national income of all the least developed countries - with their combined population of 600 million people. In the U.S., profits and CEO salaries have skyrocketed, while workers' wages slump and layoffs run rampant. Notwithstanding claims about an "end of conflict," our world has become increasingly dangerous, where powerful nations like the great United States threaten the world with war to maintain their empire. We live in a world where wealth is moving faster and faster into the hands of the few at the expense of the great, great many. As the economic distress worsens across the country and the world, and it will continue to get worse before it gets better, the outrageous class divisions result in what Marx argued was always the motor of historical change. "The history of all hitherto existing societies," Marx and Engels wrote in the first sentence of the Manifesto, "is the history of class struggle." As such, as the economy continues its decline and the U.S. Dollar imminently fails, it should, hopefully, lift the curtain from peoples' eyes and finally pull everyone away from their distractions and into a mindset that embraces collective action, unity, equality, and true and natural social progress. We are capable of so much more than our current system would or could ever allow. So on this ultimate day of capitalist propaganda, do nothing but love those around you and appreciate who you have, as the relationships you make and the time and experiences you have with your loved ones are really the only things worth working for. We are not guaranteed more than this present moment, so live today to the fullest and nobody go to work this week!